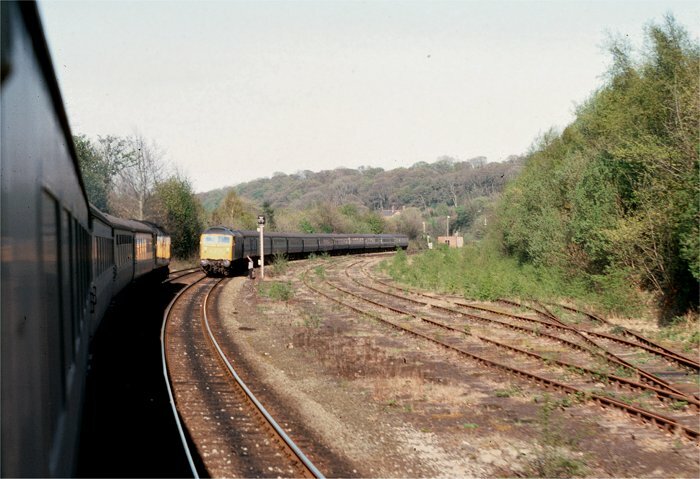 Saturday 3rd May 1980, and the 13:00 London Euston to Holyhead - hauled by 47547 - waits at signal BR10 at Menai Bridge. The driver has got down to ring Bangor Signal Box, but the reason for the red signal becomes clear as the delayed 17:03 Holyhead - Crewe passes behind 47445. The rebuilding of the Britannia Bridge left a single line section between Menai Bridge and Llanfair PG - originally controlled by the original signal boxes, but from 1973 by Bangor. Although provision was made for a second track to be added if required, the single line was able to handle the traffic on offer even at the busiest times - see the Menai Bridge pages. To the right are seen the remains of the small marshalling yard at Menai Bridge - last used a few months earlier to hold the wagons carrying steelwork for the building of the Britannia Bridge road deck, and accessed by a ground frame controlled connection to the Holyhead bound line just behind the camera.